Sometimes it helps to be a lil crazy. Wow Mick! I thought the 32 inch Bluefish (Tailor) I caught this summer was a tough customer. Those Spanish Mackeral look like a handful! Wouldn't want my hand near those teeth! Might have to drop the peak of the cockpit just a 1/4" or so, but it should work. Any progress? I hate being a pain but, you know how pumped up I get on these builds. I'm inching to build again! not much but I'm getting more back to the boats this weekend. 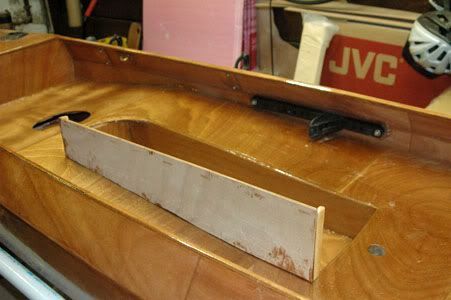 I'm revising the hybrid tandem to have the fish storage area/console between the legs of the aft paddler. 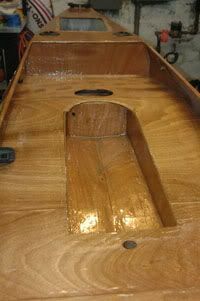 I've attached photos of where I am in the process so you can get an idea of what I'm looking for in the solo 12' hybrid. I basically cut the deck between the cockpit supports. I'm using the cockpit supports as the walls of the storage area below deck. I've got insullation behind the walls that you can't see. Above deck I'm extending to a height that matches the gunwale height so there's no additional windage. Only part of the top of the box will swing open. The end by the paddler will be a semi-circle so there are no sharp edges there. That curved end will actually be a half open storage area for water bottle, tools, lure box, etc. Still figuring that out as I go. The above deck box walls will be insulated as well. The bottom of the box is the hull. I couldn't spare the inches for insulation. But, the water stays fairly cold here anyway. From bottom to the top it's about 9.5". The width is the cockpit support width (about 11"). The length is a little over 30" below deck. The semi-circle area covers some of the below-deck storage area. On the solo, the storage area might have to extend thru the forward cockpit wall a bit. Unless we can get a little more cockpit length. Did I describe this ok? My thoughts are comfort and safety are getting significantly compromised by the center console mod. It's making re-entry even more difficult than it already is in the Sabalo. Can we see a pic with more area to judge by? Where will your chest and hips go in relation to the riser? Scott should do an re-entry at this stage. 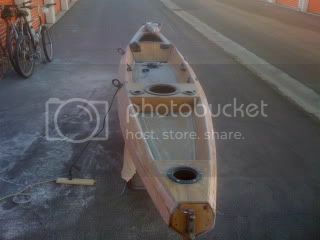 The plastics are much easier to re-enter because the right technique has the kayak always at the primary stability-point. Our SOTs are at the secondary stability-point during re-entry process, especially the singles. I can't do the exact plastic re-entry technique on my Sabalo. The plastic has two steps: 1 Entering from the left side, place your right hand on right (far) side edge and left hand on the left (near) side edge kick your feet during an arms pull with the goal of laying your chest downward in the seat...stop there and regain your breath and assure you have stability before the next step. Step 2: With your hands in the same position, do an arm press and swivel your right hip into the left side edge slope both feet will still be in the water on the left hand side panel. You will sense total stability at that position and make the final seat scoot. I understand the coolness factor, but there are big hatches, game clips, and accessaries to get by fine w/o the console IMHO. Speed improvements are much more universal to incorporate. On the west coast, kayakfisherman want more speed. P.S. The Kakazi kayak isn't very easy to re-enter either...a paddle-float might be needed for them. I don't know that my console design will have much impact on re-entry. I was careful to design it so that it did not extend above the gunwales. Thus, it should not impede re-entry. Additionally, my single has a large aft area that was designed to be a large hatched area for storing caught fish (until I got this idea). Thus, the seating area is close to the max beam station. So it's a very short slide back after re-entry. I'm sure Matt can address this better than I though. 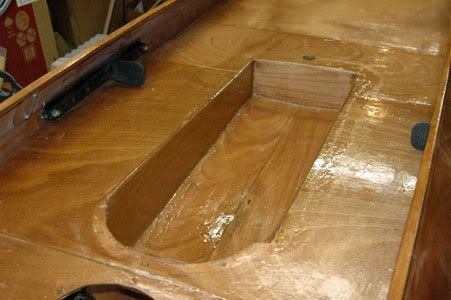 How about lowering the gunwales (cockpit side) on one side by 2-3 inches for last 1/3 of the length? That would make re-entry easier...and allow sideways seating. How I enter the Sabalo is to lean it to the secondary...doing the arms pull and waist turn and getting my hip caught (barely) on the cockpit well top edge...all in a quick motion. A few inches lower would help. Only paddling 90 degrees to 10ft swells near San Francisco have I been glad of the high gunwales. If only one side is lowered, they gives you a 50% chance of having enough height for the rarest of conditions.